By 1936 the Nazis were firmly in place in all aspects of government, society and culture. Gleichschaltung was the term for standardizing or normalizing the Nazi aberration. It meant that every aspect of the Third Reich followed the dictates of the ideological wing of the state and party. 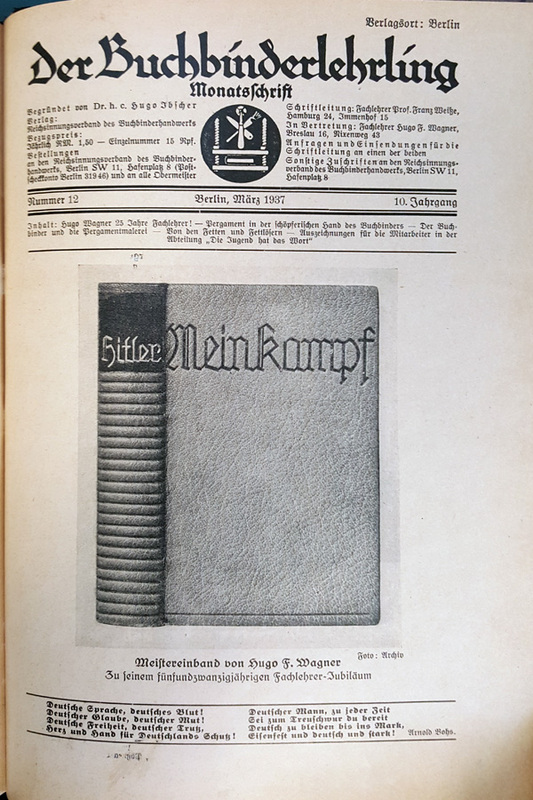 These innocent-looking letterheads, void of political references, were examples of that Gleichschaltung imposed on the design and printing industries. 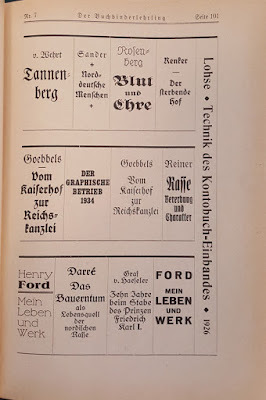 Typography for book titles from Der Buchbinderlehrling, Vol. 9, Nr. 7, 1935. 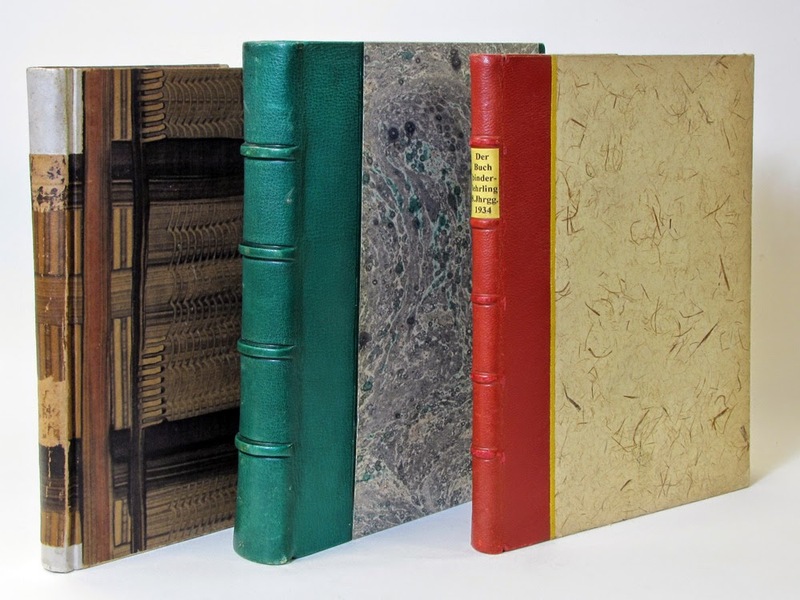 While some of title designs may seem "innocent looking," this ideological aesthetic was applied not only to bindings, but also presentation materials, desk accessories, just about everything bookbinders made forcefully, with many examples in the trade literature of the time. Prominent among these was Hitler's Mein Kampf. 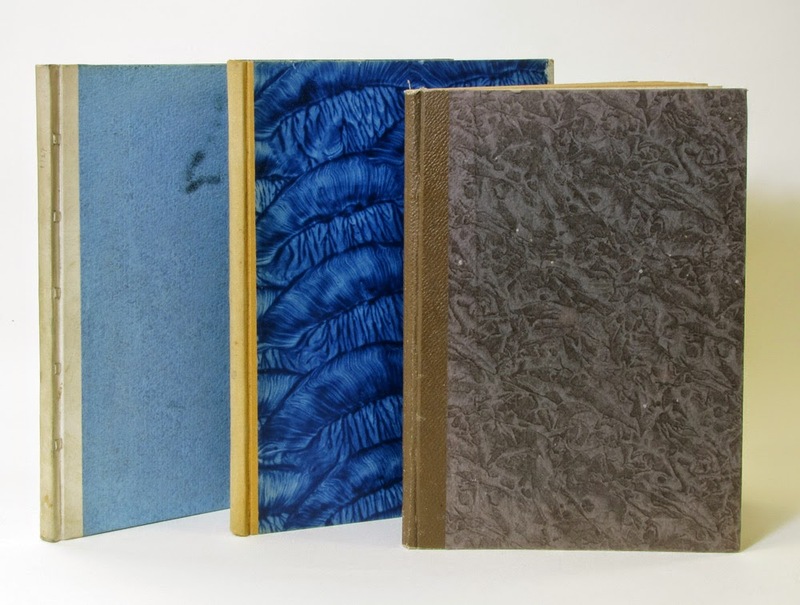 While no images from the 1933 bookbinding competition were found in Der Buchbinderlehrling, below two, one by an Martin Lehmann, an apprentice/student of Franz Weiße, and one by a master and one of the leading teachers of the day (Professors at art academies and trade schools), Hugo Wagner. 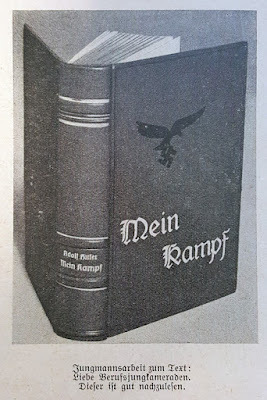 Martin Lehmann's apprentice/student binding on Mein Kampf. From Der Buchbinderlehrling. Vol. 10, Nr. 6, 1937. 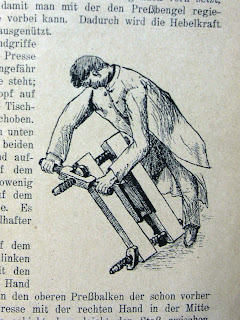 From Der Buchbinderlehrling. Vol. 11, Nr.11, 1938. 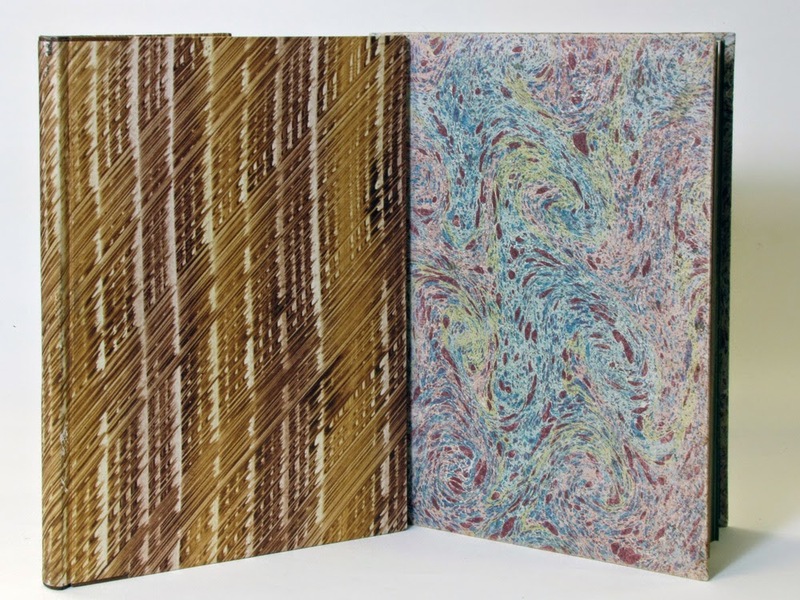 Binding by Hugo F. Wagner, Breslau, on the occasion of his 25th anniversary as a teacher. From Der Buchbinderlehrling. Vol. 10, Nr. 12, 1937. Otto Dorfner, Weimar, was another one of the leading teachers during this time, and will be featured in due time, also because he remained in the Soviet occupation zone (the DDR) after the war and continued working. 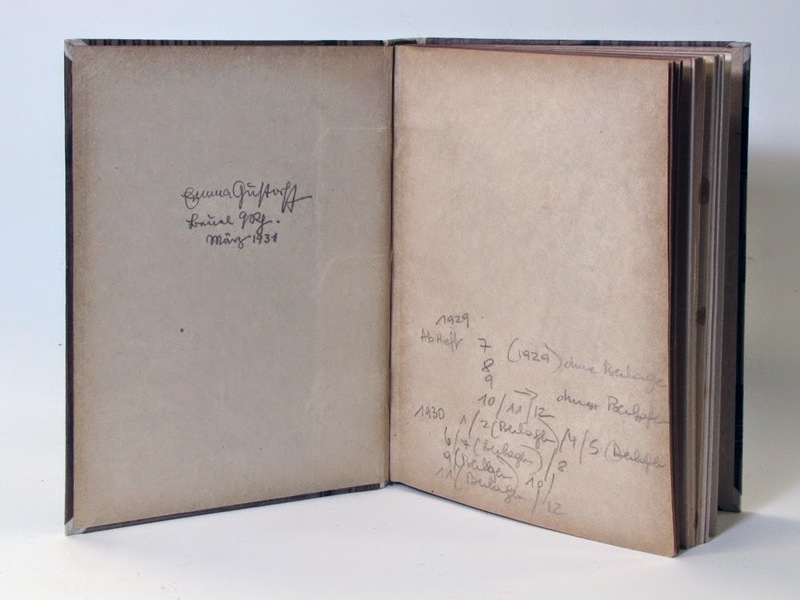 One of Germany's greatest design binders, he studied under Paul Kersten, founded his school in Weimar, taught at the Bauhaus, and elsewhere, helped found the Meister der Einbandkunst... Below another binding on Mein Kampf by one of his students, Willi Fischer. 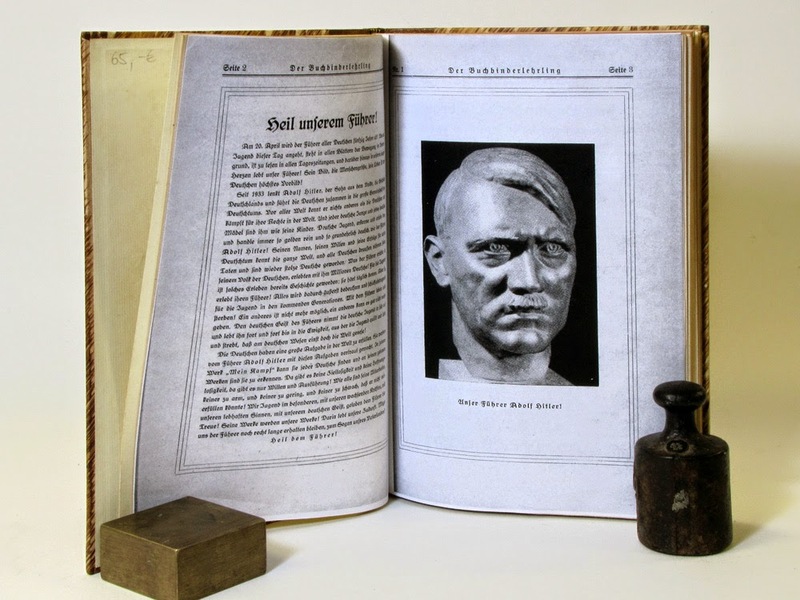 Binding by Dorfner student Willi Fischer on Mein Kampf. From the Allgemeiner Anzeiger für Buchbindereien, Nr. 27, 1936. Another teacher was Heinrich Lüers, Magdeburg, best known for Das Fachwissen des Buchbinders that appeared in several editions, including one postwar with a new introduction by his Gustav Moessner. It is very interesting to compare the editions, especially as the politically charged ones have been scrubbed out. 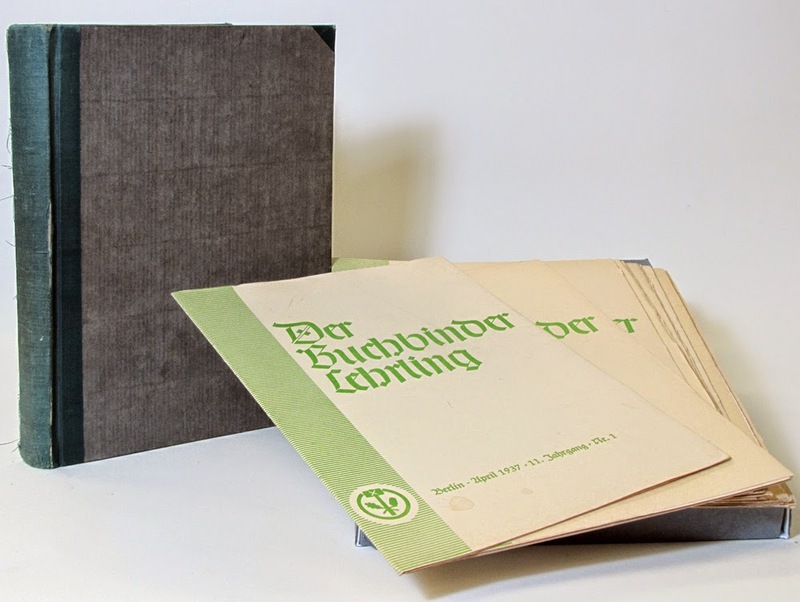 Lüers also edited Vom Buchbinderlehrling zum Buchbindemeister (1941) for the Reichsinnungsverband des Buchbinderhandwerks (the national bookbinding guild), a pamphlet produced by the BDBI describing the trade and requirements designed to attract new apprentices and others. Like Lüer's book, this too was republished after the war in a sanitized edition. After all, why waste an otherwise significant text, and Das Fachwissen is one of the best of its genre and incredibly comprehensive. 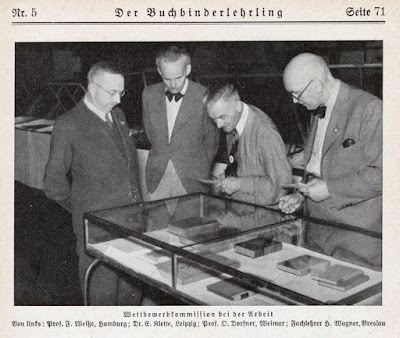 Below, Franz Weiße (Wiemeler's teacher), Erhard Klette, Otto Dorfner, and Hugo Wagner jurying the 1938 apprentice competition. 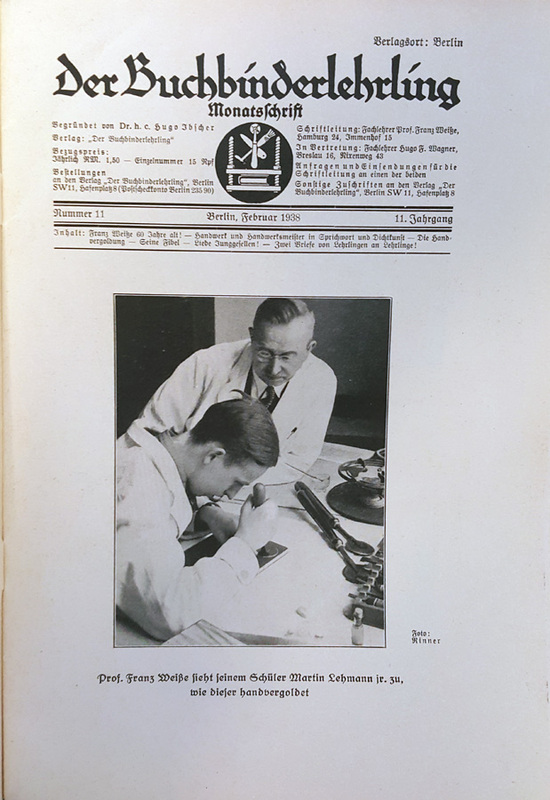 Dorfner and Wagner appear to be wearing party insignia on cravat and lapel, and Klette was an influential publisher in the field, including the Archiv für Buchbinderei and the Jahrbuch der Einbandkunst. Franz Weiße, Erhard Klette, Otto Dorfner, and Hugo Wagner jurying the 1938 apprentice competition. From Der Buchbinderlehrling, Vol. 12, Nr. 5,1938. 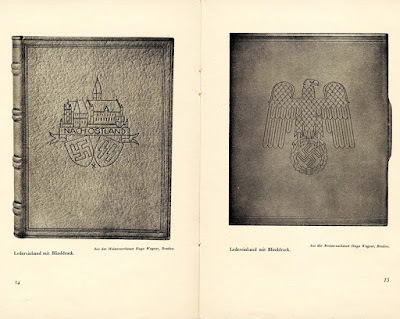 See also this post about Frieda Thiersch's similar work during this period, "Hitler's Bookbinder." 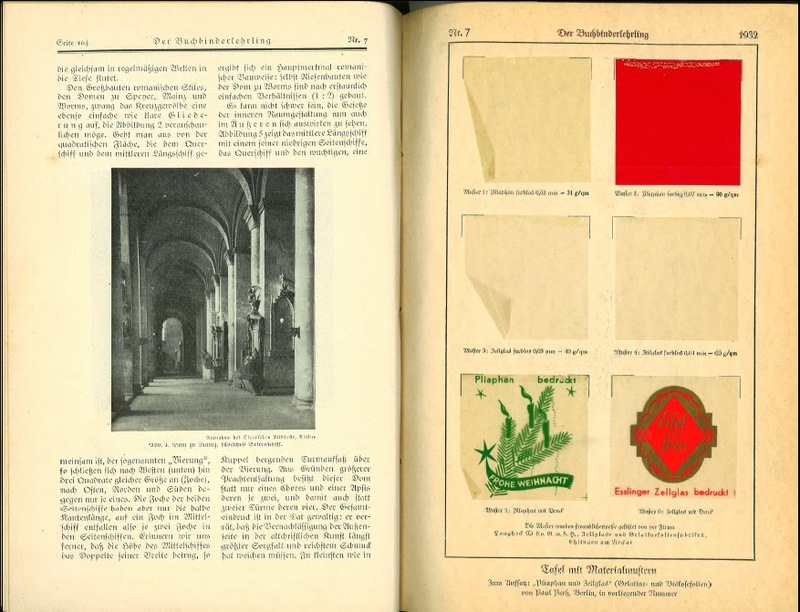 Her biography, Frieda Thiersch und ihre Handbuchbinderei (1968), by Fritz Krinitz mentions little and illustrates even less of her work from this period. So, imagine if this scenario were to return... No, let's not go there. Spent a wonderful afternoon with Jeff Peachey in Bernard Middleton's Collection in the Cary Graphic Arts Collection at RIT this week. 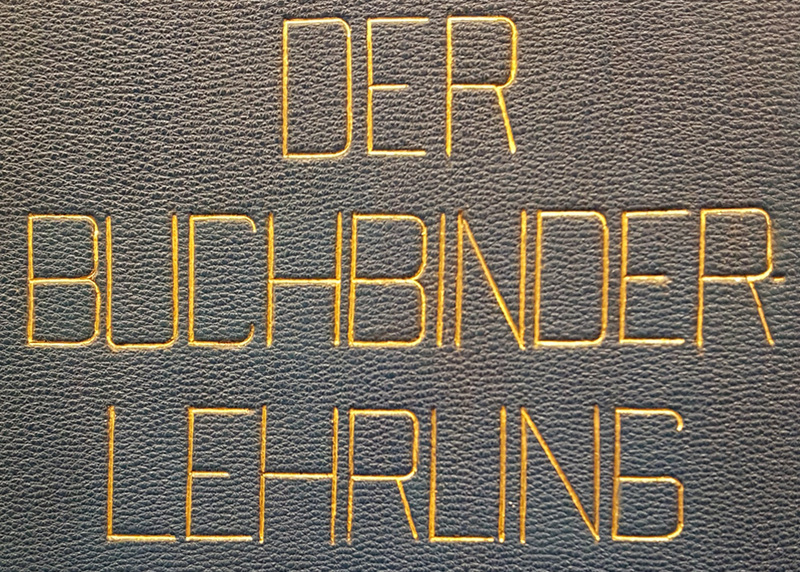 In among the treasures of this incredible collection of all things bookbinding and allied crafts was this copy of the Buchbinderlehrling from 1930. The binding was not signed, and was most likely made either for the annual apprentice bookbinding competition or the apprentice's final exam. 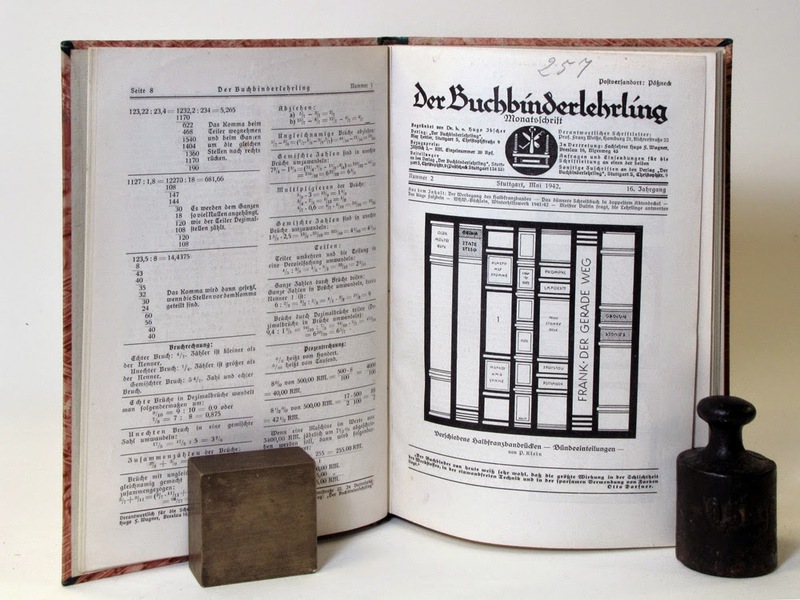 More about the Buchbinderlehrling here. Habe in dieser Woche einen wunderbaren Nachmittag mit Jeff Peachey in der Bernhard Middleton Sammlung der Cary Graphic Arts Collection von RIT verbracht. 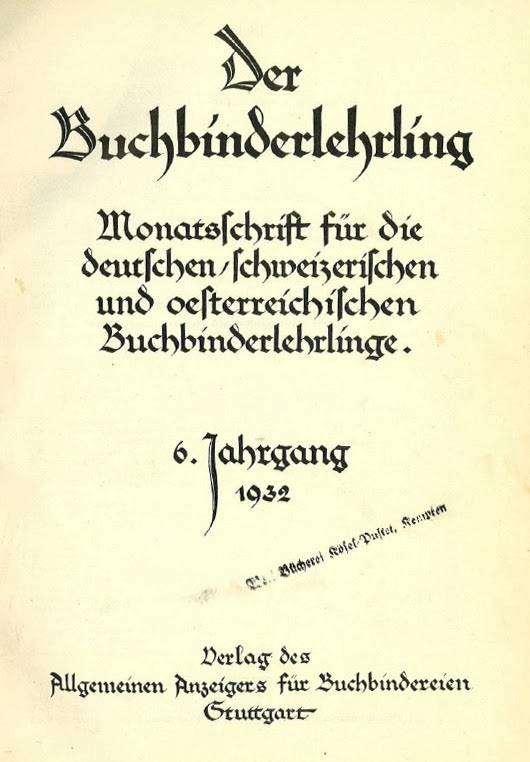 Unter den vielen Schätzen der Buchbinde- und Buchkunstliteratur war dieses Exemplar vom Buchbinderlehrling, 1930. Der Einband war nicht signiert, wurde aber in aller Wahrscheinlichkeit für den jährlichen Lehrlingswettbewerb oder die Gesellenprüfung hergestellt. 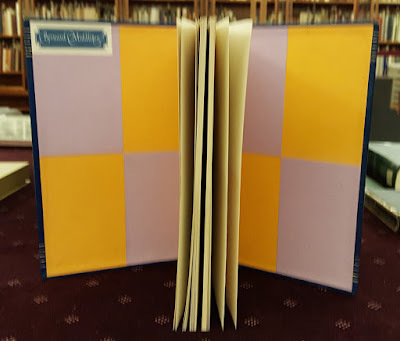 Mehr über den Buchbinderlehrling hier. Full leather binding with gilt top edge and gold tooling. Ganzfranzband mit Goldschnitt und Vergolding. Detail of the title on front board - The title was constructed using straight line and one curved pallets and gouges. Detail des Titels auf Vorderdeckel - Der Titel wurde aus Linien und ein Bogen zusammengesetzt. Title on spine - The left justification didn't work so well and there are other issues. Titel auf dem Rücken - Linkbündig und Vergoldung sind eher nicht gelungen. Blurry endpapers with Middleton's bookplate. 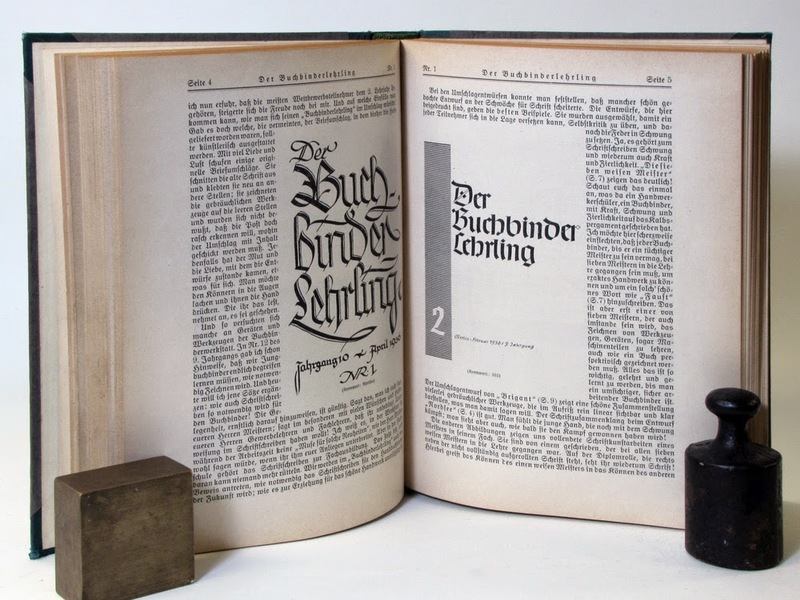 The other Adam title in this batch is Die deutscheste Art der Einbandverzierung (1928), a Festschrift for the 47th gathering of the Bundes Deutscher Buchbinder-Innungen. 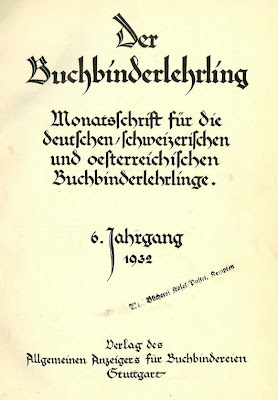 Not sure why it was the titled “the most German of binding decoration techniques” (tooling), but looks to be an interesting read. That was “bound” into a simple card wrapper… Like the one above, needs some TLC to make sure the single leaves don’t fall out. 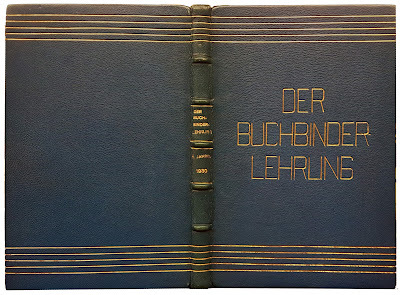 Next up E(rich) A(dolf) Bogeng’s Der Bucheinband: ein Handbuch für Buchbinder und Bücherfreunde (1940). 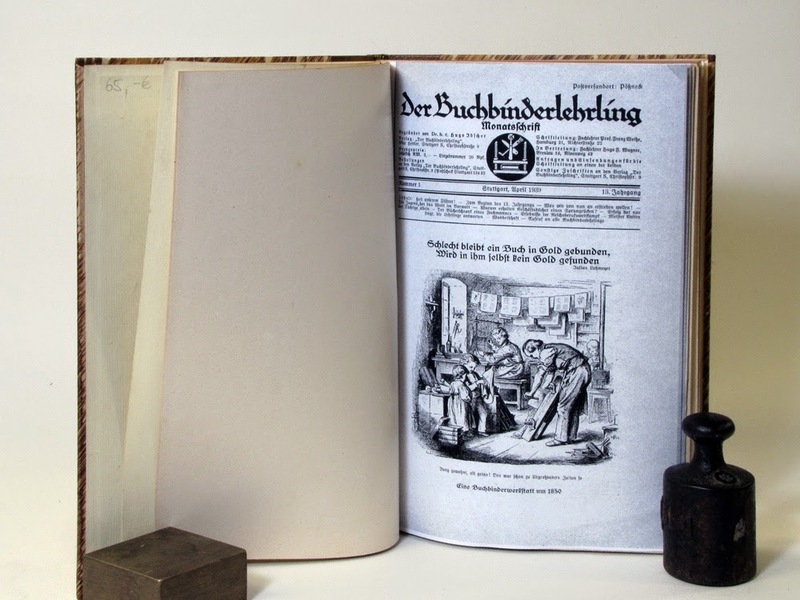 Title translated is Bookbinding: a handbook for bookbinders and bibliophiles. It’s an interesting overview of the book and book/trade history broken down into by general history; structural elements; decorative techniques; binders and bibliophiles, … I found the arrangement the interesting part – there are no illustrations. 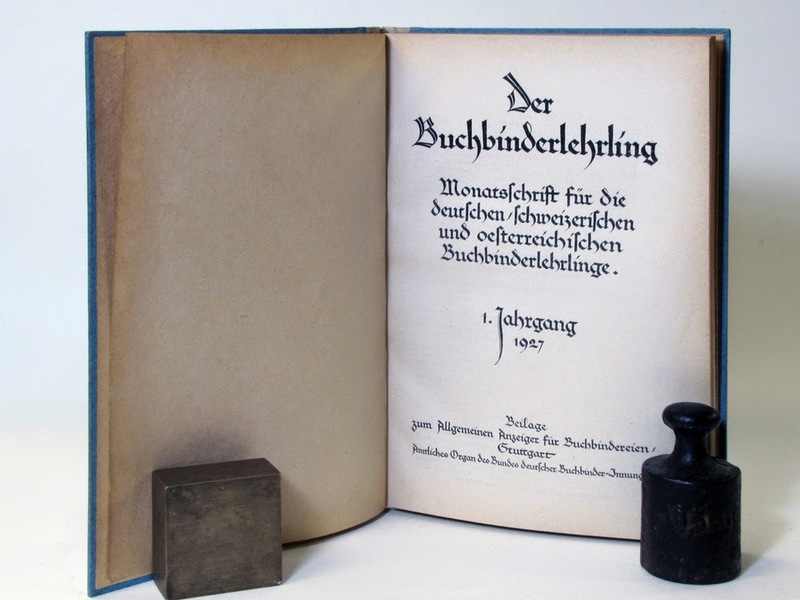 Bogeng was one of THE German writers about bookbinding and bibliophilic culture in the late 19th, first half of the 20th century. This one was reprinted in several editions. Years I received were 1932 and 1938 with 12 issues each. Quite a contrast between the two. 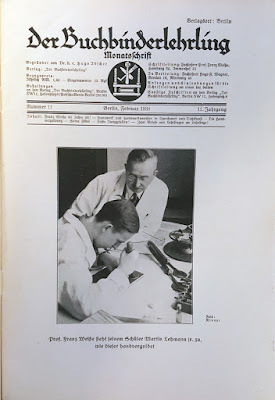 First in 1932, an article by Ernst Collin and the first in a series titled Bedeutende Männer des Buchbinderhandwerks (Important Men in Bookbinding) – the subject, Ernst's father Georg Collin, Court Bookbinder who died in 1918. Ernst' Der Pressbengel was dedicated to him. While most of Collin’s writing is academic, this was written with a much more casual tone making it more accessible for apprentices. There was also a multi-part article on gold tooling by Walter Gerlach (1892 – 1982). Trying to find out if there was a connection between him and Gerhard Gerlach. Gerhard Gerlach married Kathryn Edwards, and both studied with Wiemeler in Leipzig in the early 30s. There were also two tipped-in cards with material samples and articles on how to use those, a nice article about the life and impact of Roger Payne (illustrated by the engraving of him hunched over a press), and one telling soon to be journeymen that despite the fact that most would be unemployed after completing their apprenticeship, that they should remain hopeful and engaged. Also an interesting, ongoing series about architectural styles and history. 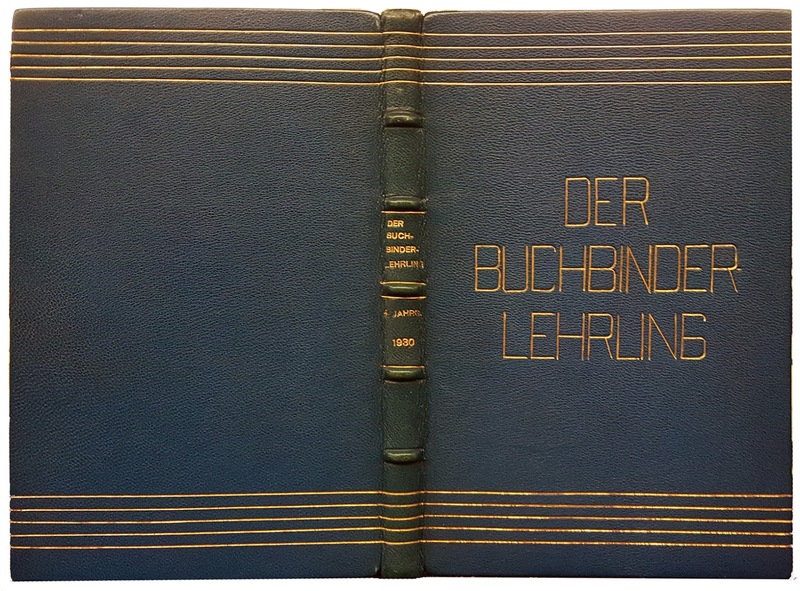 Buchatelier Bischoff in German is reprinting the complete run of the Buchbinderlehrling (1927 – 1944) on a subscription basis, every two months a new year... I already received 1927. 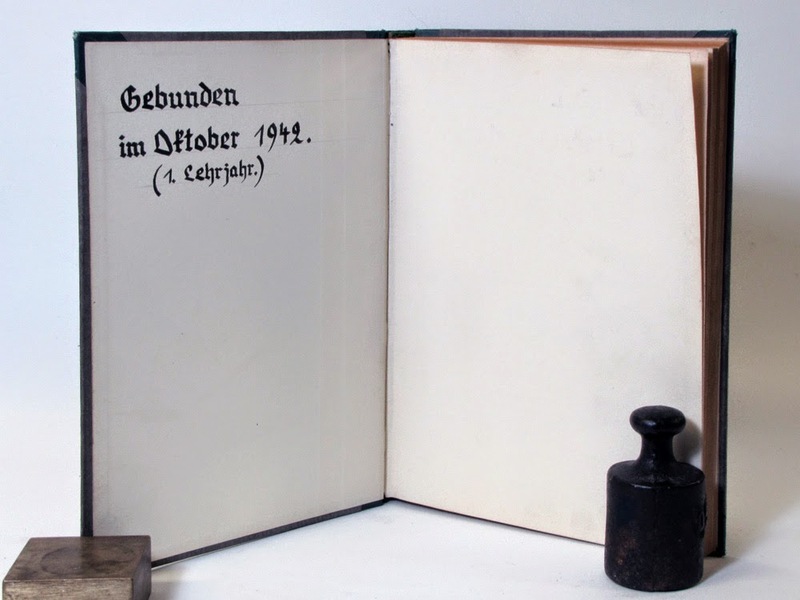 No Ernst Collin articles, but several by Maria Luers, the first woman bookbinding Meister in Germany. This is going to be fun. 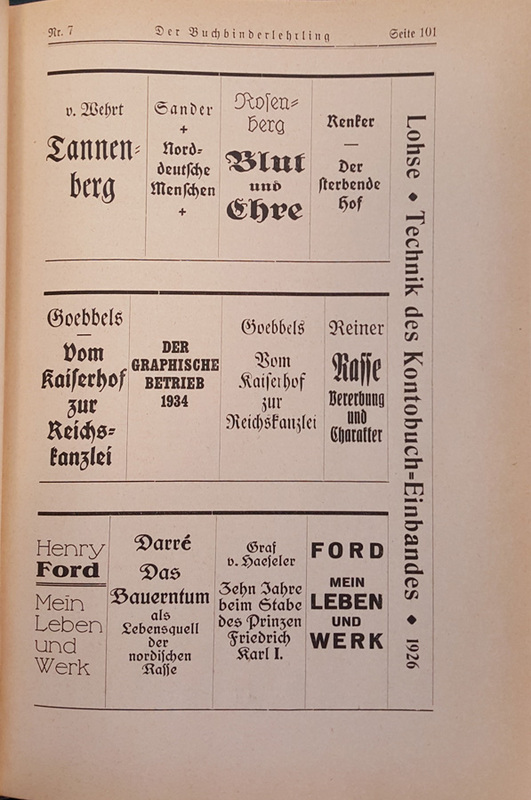 They also republish many other classic German binding titles in sheets or bound. Check them out. 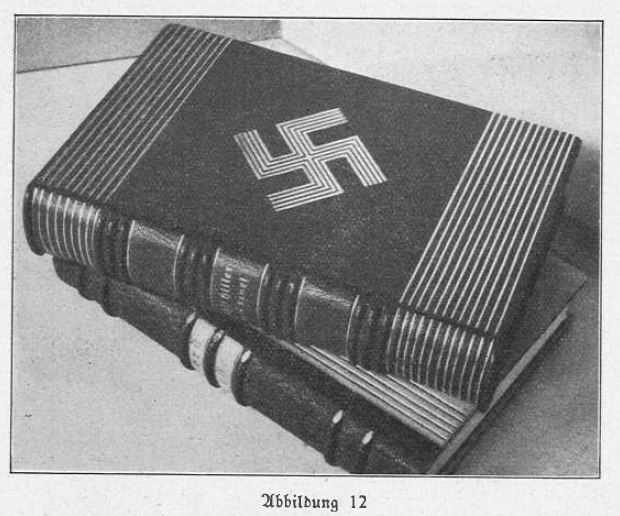 Another image from the 1938 volume. Almost as a logical follow-up to the 1938 issue above, a nice catalog Ausstellung Malerei, Graphik, Buchkunst (1955) that featured bindings by Otto Dorfner in addition to the prints and paintings by two other artists. 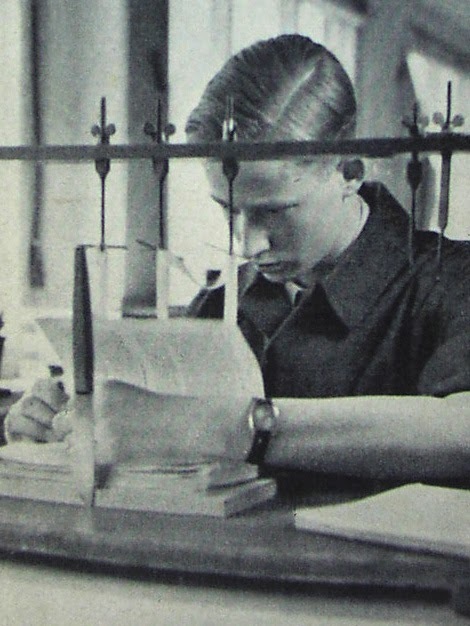 Dorfner worked largely in Weimer, a town that ended up in the Soviet Occupation Zone after the war, what became the German Democratic Republic (DDR). 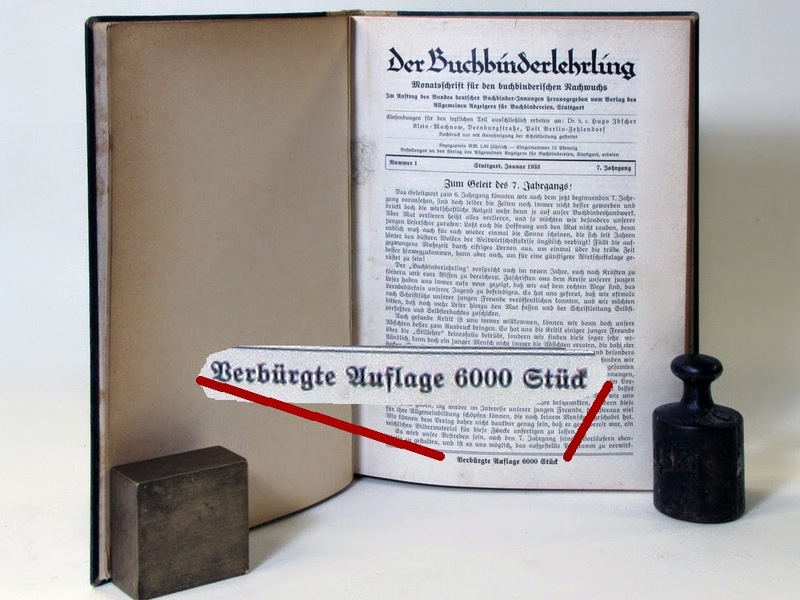 Stylistically, the binding shown continue the strong German style of design and tooling that was also used by Wiemeler…. 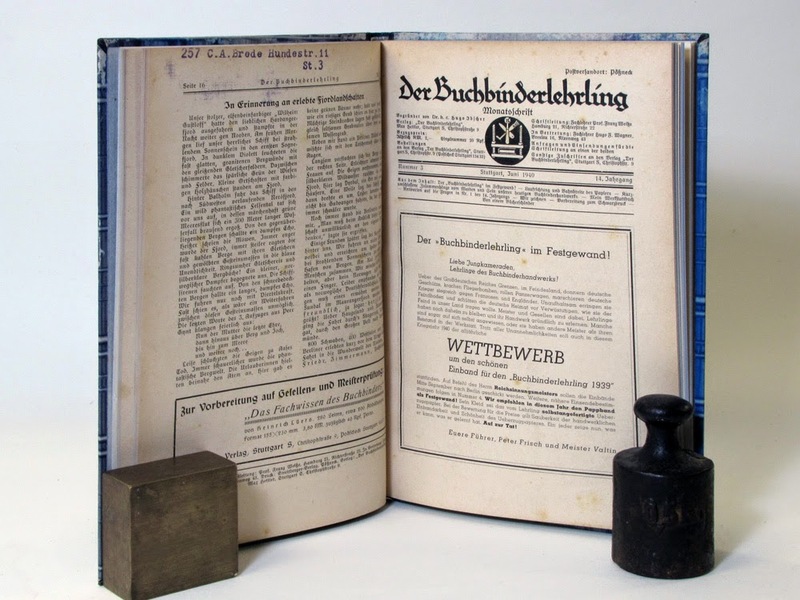 Interestingly, in addition to books by Goethe, there are also bindings on works by Stalin, Karl Marx, Ernst Thälman, Wilhelm Pieck, … Communists, Soviets, and East German leaders all. I think that there is a post/article in there about politics and the trade(s). Just need to line up some visuals (have lots in various books) and try to find some examples elsewhere. 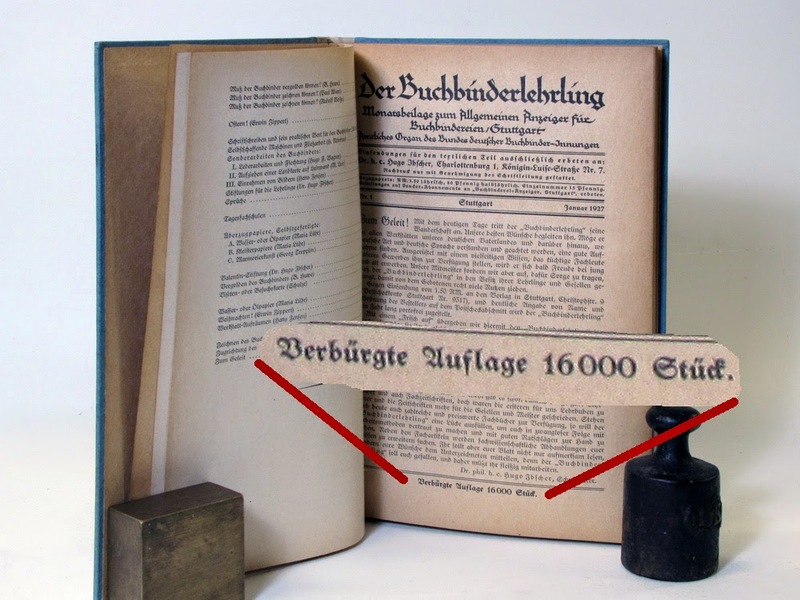 I could start it off with a "song" sung at the German Bookbinder's Assembly in Berlin in which the formation of the German Empire in 1871 is described in the context of binding a book... Designer Bookbinders had a 2008 exhibition Socialism: A Celebration in which binders selected historically significant socialist texts from the collection of Lord Tom Sawyer of Darlington, but that exhibition was not about the bookbinding trade in the service of a particular ruling ideology. 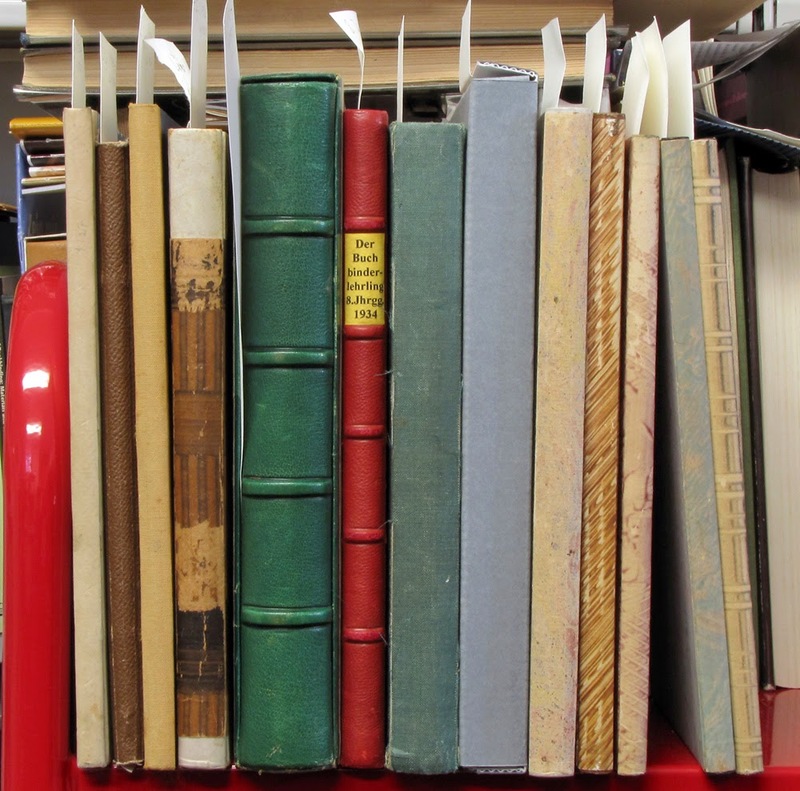 There is also a rich history of Marxist (and other) children's books, but that's not design bookbinding either... If anyone has any examples I'd love to hear about them. 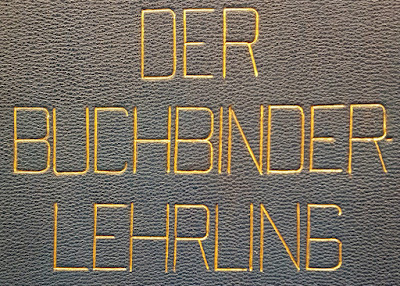 Another book was the 1995 Festschrift of the Buchbinder-Innung (Guild) Berlin-Brandenburg. Lots of interesting details about the trade in Berlin over 400 years also indicating some differences with the Verein Berliner Buchbindermeister (Organization of Master Bookbinders in Berlin) whose Chronik I also own, and that provided lots of good information on the Collins. Some of the differences apparently center on Maria Lühr (first woman to learn the trade under Georg Collin and Joseph Zaehnsdorf, and first female Meister in Germany), the role of women in the trade and training, and the Lette Verein, an organization for women that taught trades. It still exists. This is from a most curious assembled typescript I just bought, "with pp. 1-12 (and possibly an unnumbered 13th page following) provided in original typescript, pp. 11-34 (continuing the text uninterrupted, though in a different type font) provided in facsimile/photocopy, all printed on recto only. The latter portion shows several stamps from the University of Kentucky Libraries and various corrections to the typescript, so we are tempted to assume that it may be a copy." 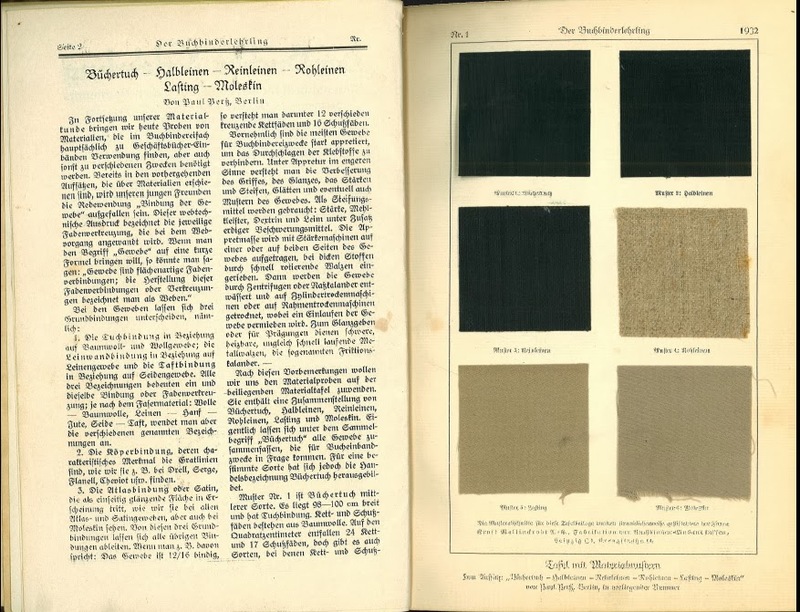 Thompson's titels contain much information of interest (in particular to me) on German-trained binders in the US. Many of those named were indicated as being members of the Guild of Book Workers, too. 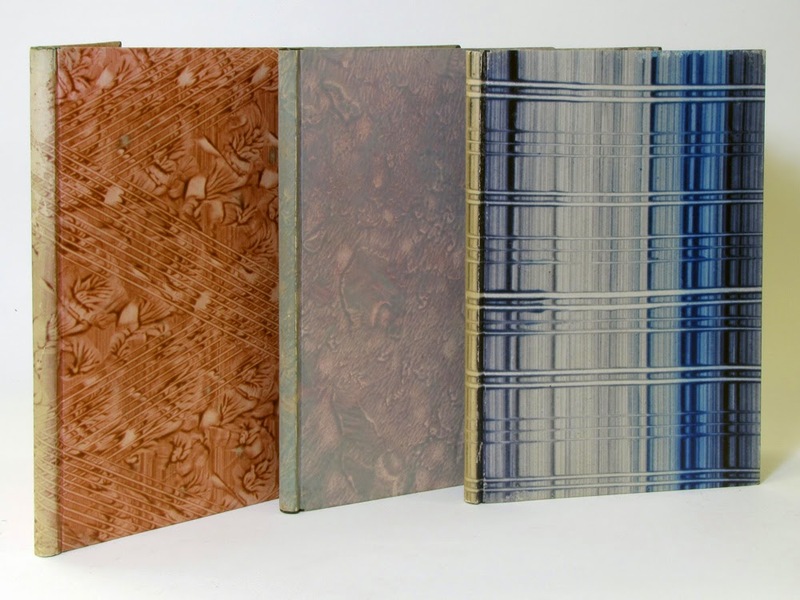 He also published Fine Binding In America, The Story Of The Club Bindery, but that is a different book. 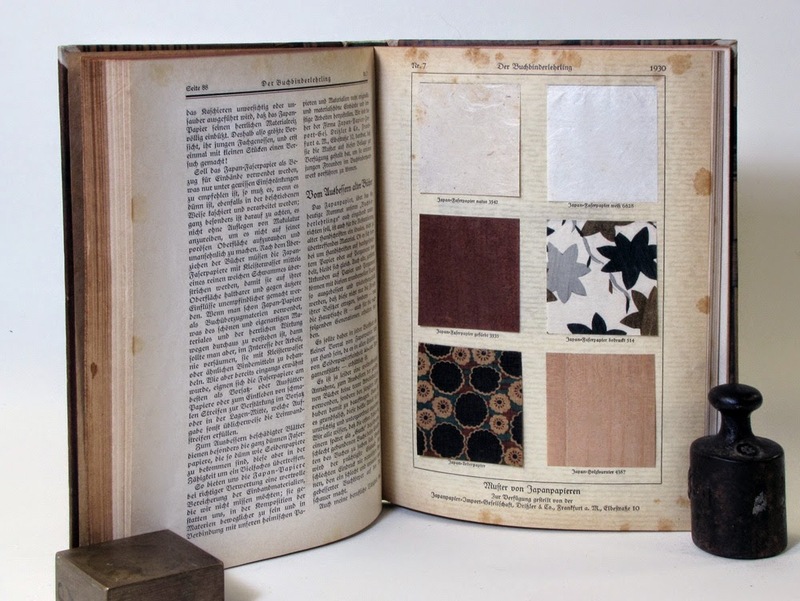 A Short History... concluded with "Even in the atomic age, hand bookbinding will have a strong place in the culture of the United States." Thoughts? The interlibrary loan department at Syracuse also came through with some articles by Ernst Collin from 1934-36, and one about the Collins' as Hofbuchbinder that also mentioned Ernst from the 1947 (all from the Allgemeiner Anzeiger für Buchbindereien). VERY glad to have those.